With us on staff we have three stonemasons, a qualified brick layer (with a commerce degree! ), a structural landscaper and two stonemason apprentices. Since we started the business we have trained six of our employees to achieve their stonemasonary trade qualifications. We enjoy a challenge and will quote on any task that involves the use of stone and a requirement to design so that your ideas can be fulfilled. At J&J we are 'yes' men and will turn your ideas into reality across a wide range of stone types and styles. No job is unachievable! We have all the equipment we need to get the job done. Over the last decade we've built up our business with appropriate equipment such as an excavator, a tip truck with a crane, a mini loader, hydrolic stone splitter, stone saws, and many other specialist tools to complete your project requirements. We sponsor a local team, the Bundanoon Islanders Rugby Club and support many other local and trade specific charities. We are fully committed to our business, our staff and our clients. And this year, as confirmation of our approach to and management of our work we've received an award from The Master Builders Association for our work on a project at Wingacarribee Street in Berrima. 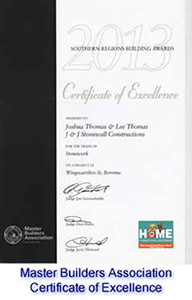 The award, "Master Builders Certificate of Excellence in Stonework" in 2013, recognises our work as stonemasons.